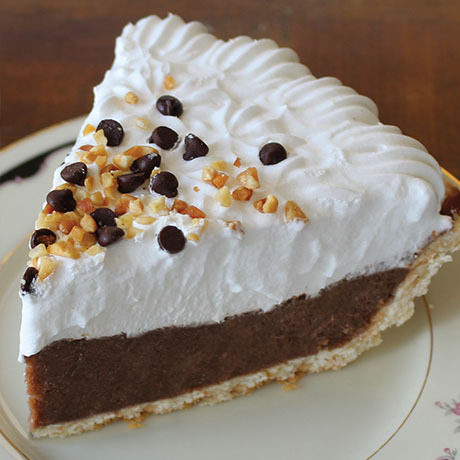 A chocolate cookie crust holds a double layer of peanut butter and chocolate silk, all topped with fluffy whipped topping and real peanuts. 10" diameter. 33 ounces. Contains Wheat, Soy, Milk, Eggs and Peanuts. May Contain Traces of Tree Nuts. Sugar, Whipped Topping (Water, Palm Kernel Oil, Sugar, Coconut Oil, Sodium Caseinate [Milk], Natural Flavor, Polysorbate 60, Sorbitan Monostearate, Xanthan Gum, Guar Gum, Beta Carotene for Color), Chocolate Cookie Meal (Enriched Wheat Flour [Wheat Flour, Niacin, Reduced Iron, Thiamin Mononitrate, Riboflavin, Folic Acid], Sugar, Canola Oil, Cocoa processed with Alkali, Invert Sugar [Cane Syrup], Chocolate Liquor, Salt, Baking Soda, Natural Flavor, Soy Lecithin), Eggs, Margarine (Palm Oil, Soybean Oil, Water, Salt, Vegetable Mono- and Diglycerides, Soy Lecithin, Sodium Benzoate [Preservative], Citric Acid, Natural and Artificial Flavor, Vitamin A Palmitate Added, Beta Carotene [Color], Whey[Milk]), Peanuts, Butter (Pasteurized Cream [Milk], Salt), Vegetable Oil (Palm Oil, Soybean Oil, Cottonseed Oil, Mono- and Diglycerides, Polysorbate 60), Cookie Pieces (Enriched Flour [Wheat Flour, Niacin, Reduced Iron, Thiamin Mononitrate, Riboflavin, Folic Acid], Sugar, Vegetable Oil [Soybean, Palm and Palm Kernel Oil], Dextrose, Degerminated Yellow Corn Flour, Cocoa Processed with Alkali, Invert Sugar, Chocolate, Leavening [Baking Soda, Monocalcium Phosphate], Salt, Cornstarch, Natural Flavor, Soy Lecithin, Whey [Milk]), Water, Corn Syrup Solids, Peanut Pie Base (Peanuts, Hydrogenated Rapeseed Oil, Hydrogenated Cottonseed Oil, Peanut Oil, Mono- and Diglycerides), Cocoa Processed with Alkali, Natural Flavor, Gum Blend (Sodium Alginate, Calcium Sulfate, Tetrasodium Diphosphate, Sucrose), Salt, Soy Lecithin.